Where The coast of Normandy, France, stretching from the east coast of the Contentin Peninsula to the west bank of the River Orne. Five invasion beaches: in the east (left flank), the Anglo-Canadian sectors of “Sword,” “Juno,” and “Gold,” and in the west (right flank), two U.S. beaches, “Omaha” and “Utah.” The beaches were “dedicated” so that selected follow-up divisions could land on them. What The largest amphibious operation in history marked the Western Allies’ return to Northwestern Europe. Total Allied strength: 176,000 troops, 4,000 ships and landing craft, 600 warships, 2,500 heavy bombers, and 7,000 fighter planes. Allied air resources consisted of the U.S. 8th and 9th Air Forces and the British 2nd Tactical Air Force. (Altogether more than a million American soldiers, 124,000 sailors, and 427,000 aviators were involved in Operation Overload.) Total German strength: 850,000 troops, 1,552 tanks, and 800 aircraft. Why The British and Americans had long intended to return to German-occupied Northern Europe, and Normandy provided suitable beaches within range of England-based air cover. 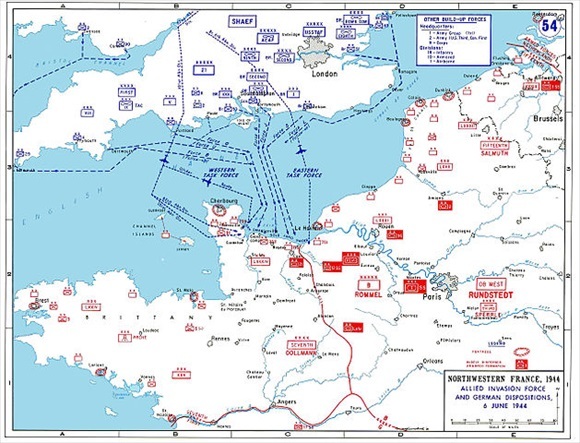 Landings in the south of France in August (Operation Dragoon) were a diversion and an adjunct to Overlord. Outcome The massive, meticulously planned invasion of Western Europe allowed Allied forces to establish themselves ashore. On D‑Day the Allies flew almost 15,000 air sorties, while the Germans managed only 319. The inability of the enemy to mount a credible counterattack within the first 24 hours meant that Germany had lost the battle for Normandy. The success­ful landings, mate­rially assisted by French Resis­tance fighters who dis­rupted the German response to the Allied inva­sion, marked a crucial turning point in the war. Hitler’s Third Reich found itself locked in a war of attrition on three fronts (France, Italy, and the Soviet Union) that would overwhelm it in less than a year.